This ballerina birthday cake was a request from a friend to celebrate the first birthday of her daughter. She brought me the decorations for the party and I tried to copy them into the cake. This is a two tier cake, one vanilla pound cake and the top is strawberry cake. I decided to make the bottom in pound cake since I wanted a strong and firm cake in the bottom. I was going to put some decorations without any base. But I inserted 6 wood dowels to secure the top cake. I glued the cakes together with royal icing. The top cake was made like a pound cake but I added the strawberry flavor, the dry fruits (strawberries) and the color to the mix. I even added some nuts for the wow factor. 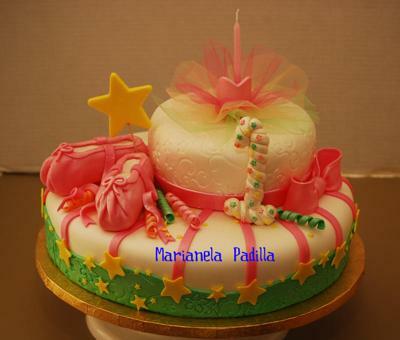 Both cakes were covered with vegetable almond frosting and then covered with homemade almond flavor fondant. The strawberry cake was filled with strawberry jam. All decorations were made from gum paste. They were made in advance to achieve the right consistency. The ballerina slips were made from rice cereal and covered with fondant. The tulle dress was made with tulle fabric but the body was made from gum paste. I cut a heart with a cookie cutter to give the torso shape. I used the fondant imprint mat to give some texture to the fondant of the top cake and to the edge of the bottom cake. The final touch was the airbrush finish in sheen pearl to cover the whole cake. Online writers are ensure understudies submit fragment and game plan supplies. Our expert essay writers For More information Visit Our Website-Ordercollegepapers.com will light up every part of any tip and precious data in script. Before understudies submit such a lapse part and expert handle the lion's share of their paper forming professionally. Online writers are ensuring understudies submit molecule and game plan requirements. Our professional essay writers will illuminate every piece of any point and valuable data in writing. Thank you girls. I really appreciate your comments. I started with cakes last September 2009. I try very hard.